Glow in the dark hemp cord, 3 spool pack, this cord is 1mm thick, 2olb test strength and one roll holds approximately 198 feet of cord that really glows in the dark! You will receive three spools. ★ How does it glow? 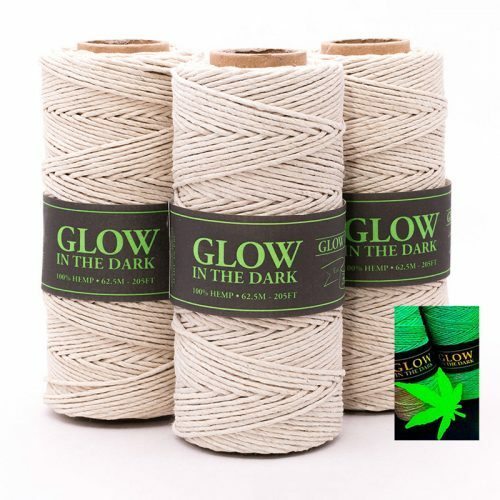 Glow hemp is created with light absorbing photo luminescent materials that glow in the dark after absorbing sunlight for 3 minutes or any UV party light. The luminescent material is non toxic, azo chemical free, does not contain any harmful substances and is safe to wear and use. Hemp jewelry made with this product is to be treated like any other hemp accessory, keep out of water to ensure your jewelry lasts a long time.